The savings mean the taxpayer will have to give the bank less cash to keep it afloat. 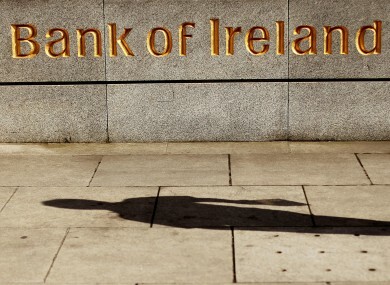 BANK OF IRELAND has confirmed that it has raised about €2bn in new capital, after the majority of its junior bondholders opted to take up a deal where they swapped their bonds for shares or cash. 72.4 per cent of the bank’s junior bondholders – to whom the bank owes €1.9bn – have taken up the offer so far, the bank said in a statement to the London stock exchange this afternoon. The bank had announced the offer on May 31, outlining two options: either the bondholders accept a stakeholding in the bank (or cash), or face receiving as little as 10 per cent of the amount they are owed. 95.4 per cent of those bondholders chose to convert their bonds to shares, with the small remaining amount instead a cash payout. As a result, the bank said, its burden-sharing exercises would raise €1.98bn in total – reducing the amount the public will need to inject to keep the bank afloat. The bank is required to raise €4.6bn under the terms of the March stress tests. Remaining bondholders have until July 7 to agree to the deal. Bank of Ireland is the last Irish banking institution not to be under majority state control, with the state owning 36 per cent of the bank. The bank warned that if no other bondholders were to take a stake in it, the State would have to cover the shortfall – pushing its ownership to 69.2 per cent. If the State takes a majority stake in BoI, it will effectively have nationalised the entire banking sector. Separately this evening, AIB said it was close to agreeing how many new shares the State would take in exchange for its €13.3bn investment under the same stress tests. The bank warned that the 7 per cent of shares currently owned by private investors could be diluted even further. Email “Bank of Ireland deal knocks €2bn off taxpayer’s bill”. Feedback on “Bank of Ireland deal knocks €2bn off taxpayer’s bill”.